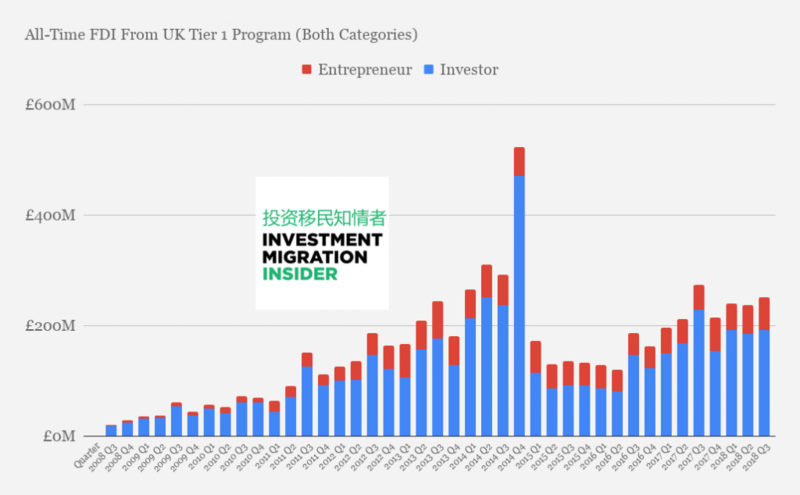 As the UK Tier 1 Visa program turns 10 years old, we’re taking a deep dive into the statistical archives of the Home Office to recap a decade of immigrant investment and entrepreneurship on the British Isles. 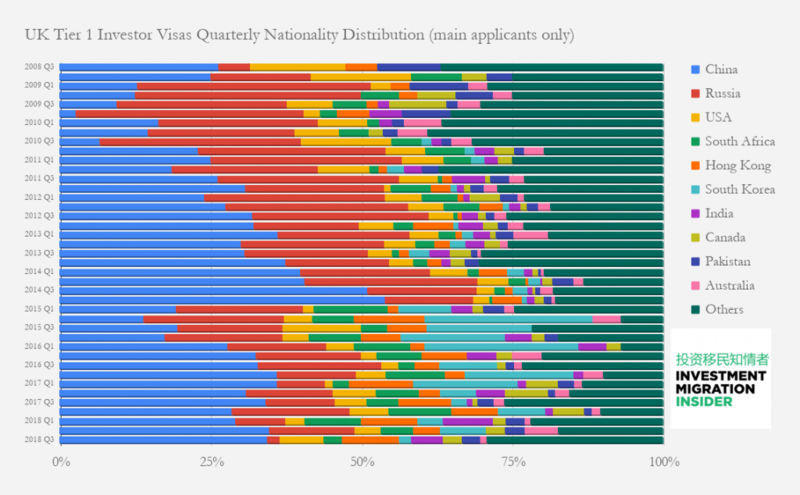 The United Kingdom’s Tier 1 Visa program – which has both an investor and an Entrepreneur category – published its first statistical overview in the third quarter of 2008. Today, exactly ten years later, the Office for National Statistics released figures Q3 2018. 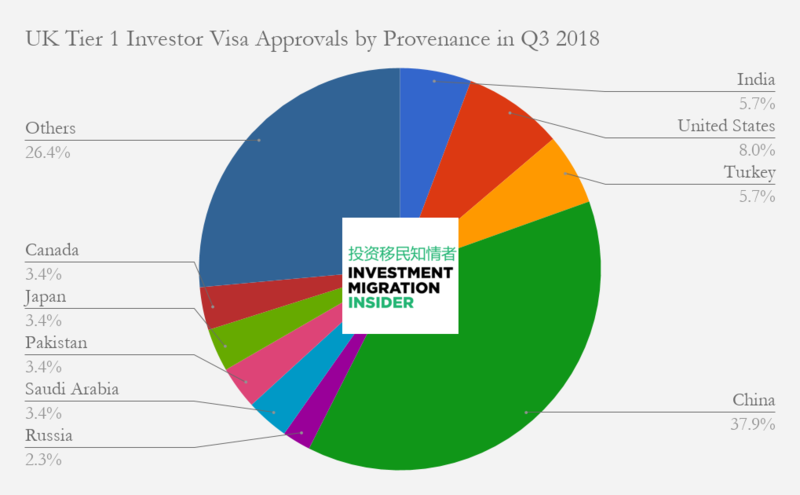 In Q3 2018, the home office issued visas to 96 investors (and 172 of their dependents) and 296 entrepreneurs (as well as 552 of their dependents). 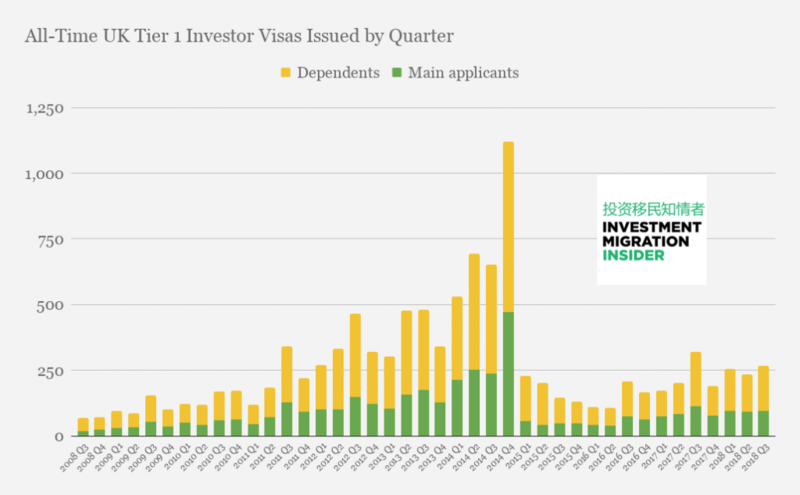 Application volume for the Investor category is up 4% compared to last month, but down 16% compared to the same quarter last year. 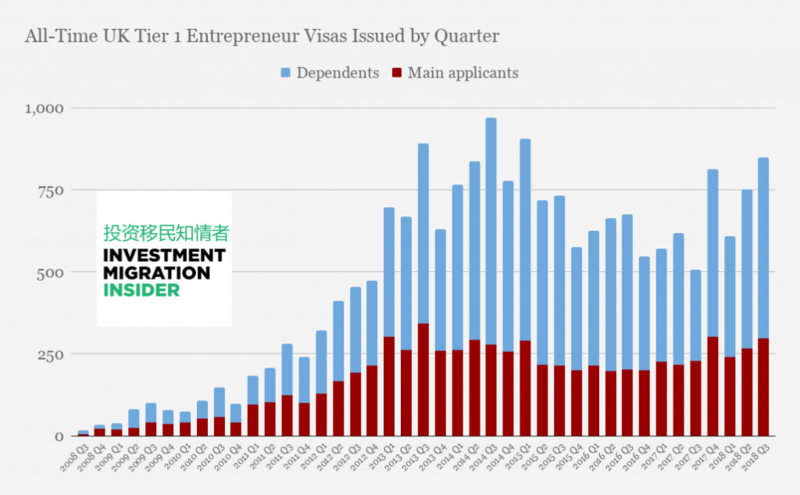 The Entrepreneur category is up 11% since last quarter and up 30% compared to Q3 2017. If the 2018 trend continues apace, the Investor category will finish slightly ahead of 2017, while the Entrepreneur category looks set to outperform itself by 28% this year. Chinese investors accounted for 38% of visas issued under the Investor category in the third quarter. 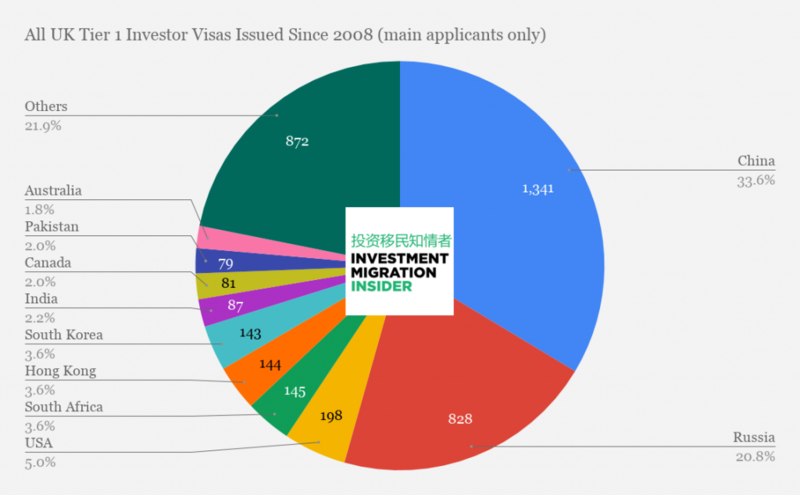 Overall, since 2008, Chinese nationals account for 34% (1,341) of investor visas. 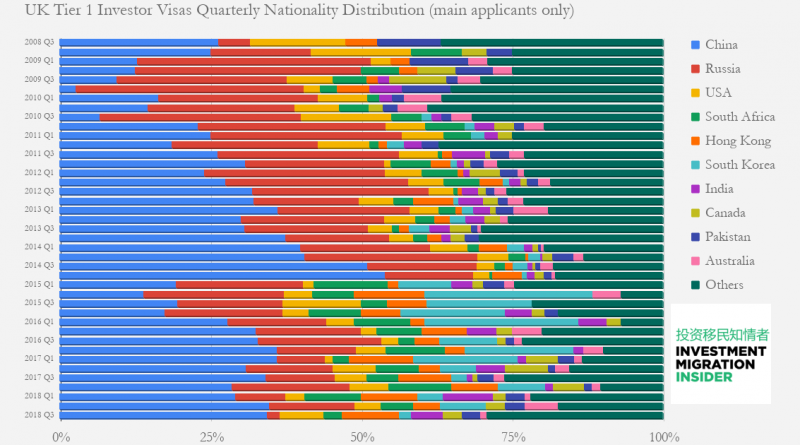 Russians have seen their share of the program crater almost completely. 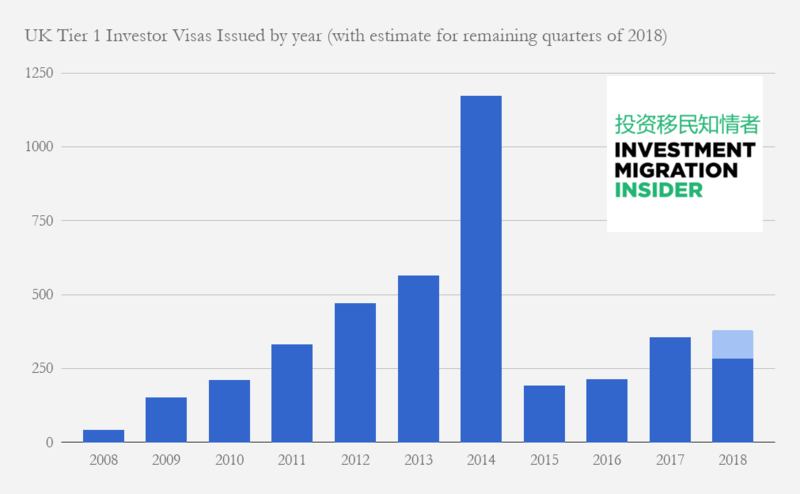 While they still make up more than a fifth (828) of all investor visas issued since 2008, only two Russians received such visas in Q3 2018. 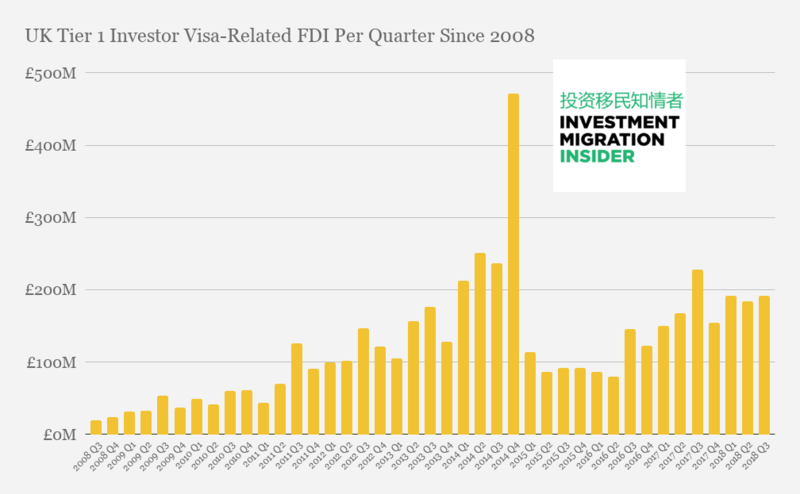 American, Turkish, and Indian investor interest in the UK Tier 1 Investor Visa continues to grow steadily. In 2018 so far, the home office has issued 284 investor visas and 803 entrepreneur visas to main applicants, raising investments of at least GBP 729 million (US$930 million) in the process. 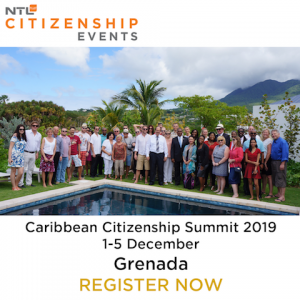 Since the program opened in 2008, it’s raised a total of GBP 6.47 billion, or about US$8.3 billion. 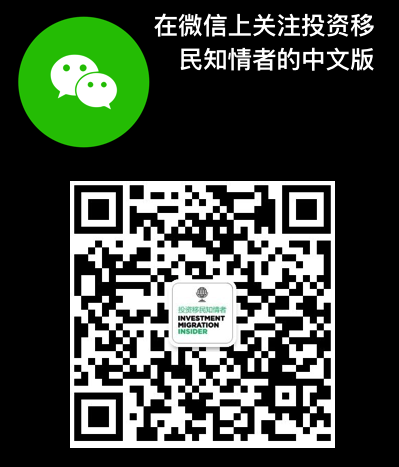 The Investor and Entrepreneur categories respectively accounted for some 71% and 29% of the total. 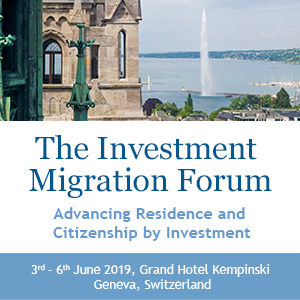 The US$ 8.3bn raised through the program since 2008 is roughly equivalent to the GDP of countries like Moldova, Haiti, and Kosovo. There are 65 countries with a GDP of less than US$8.3bn. 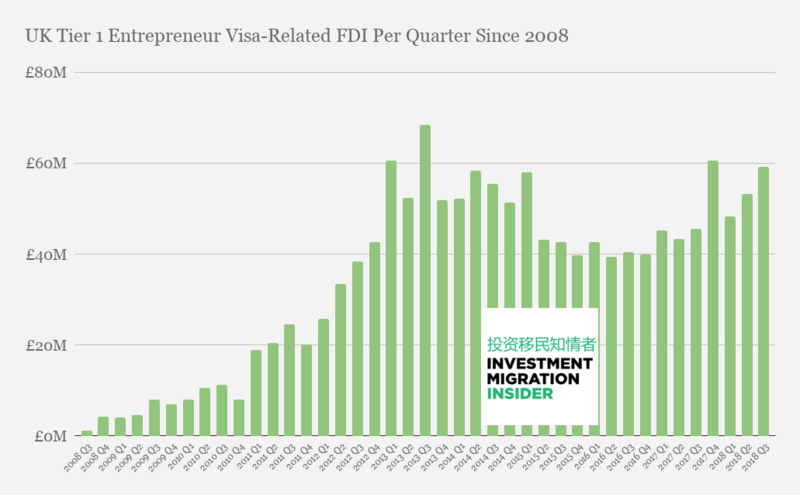 Only one country – the United States – has raised more FDI through investor migrants than the UK. 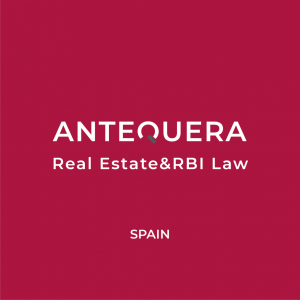 The value of entrepreneurial activity arising from these investments is, naturally, incalculable, but it doubtlessly exceeds that of the direct investments by an order of magnitude. 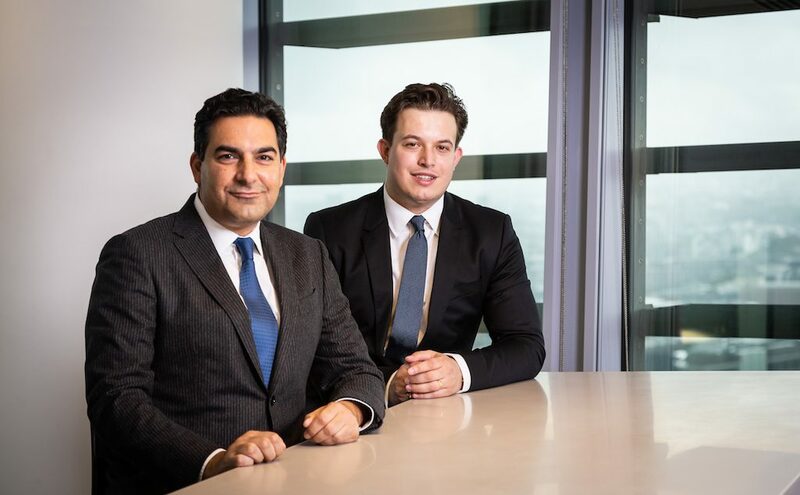 “The continued strong demand for the UK Tier 1 Investor visa, in my opinion, is attributable to Brexit; we’ve witnessed a steady increase in applicants since the referendum,” says Farzin Yazdi, head of Investor Visa at Shard Capital, headquartered in London.